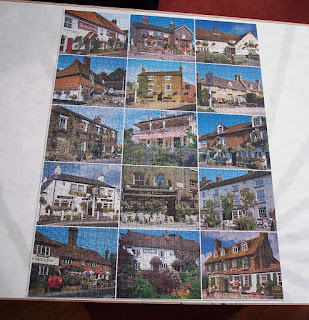 My jigsaw compulsion continues unabated, though I am reading too because there's very little on TV in the evenings to keep my interest. I'm not much into sport and at the moment it's all Winter Olympics, Football, Rugby... Anyway, these are some I've been doing over the last six weeks or so. 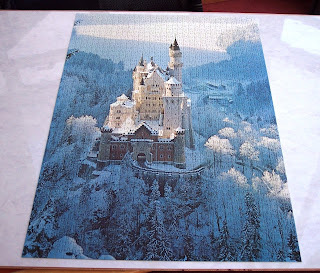 The castle in Germany whose name I can't pronounce - Neushwanstein - beautiful place anyway. This one is 1,500 pieces and was a bit tricky. 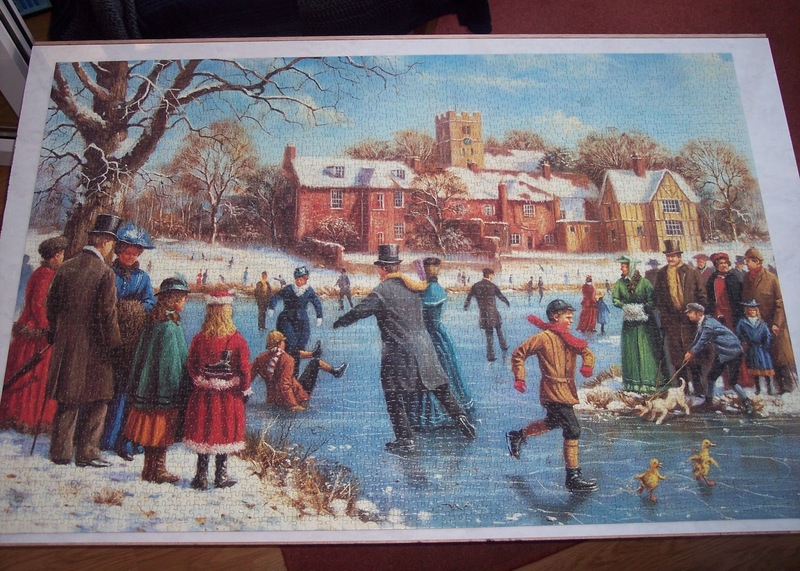 This one is entitled 'Skaters' and was painted by Kevin Walsh. 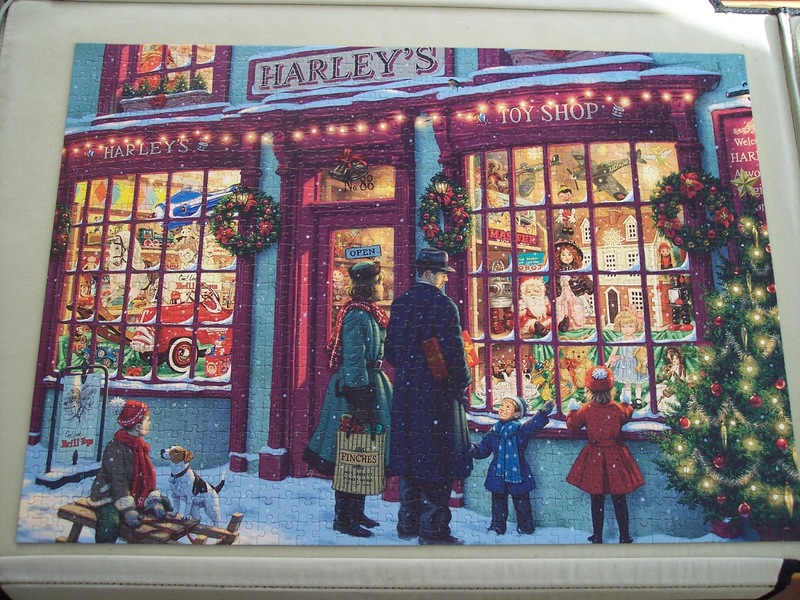 3,000 pieces, very enjoyable to do. 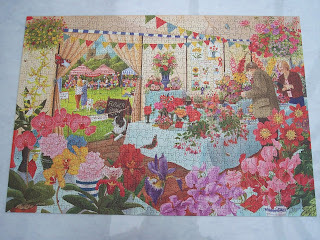 Quick and easy, The Flower Show, 1,000 pieces, a library puzzle with a piece missing. 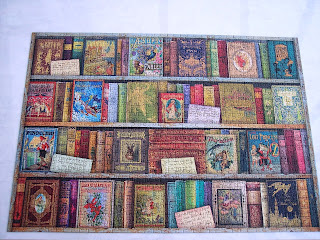 Christmas gift, really delightful to do and featuring one of my favourite things - old books. 1,000 pieces. 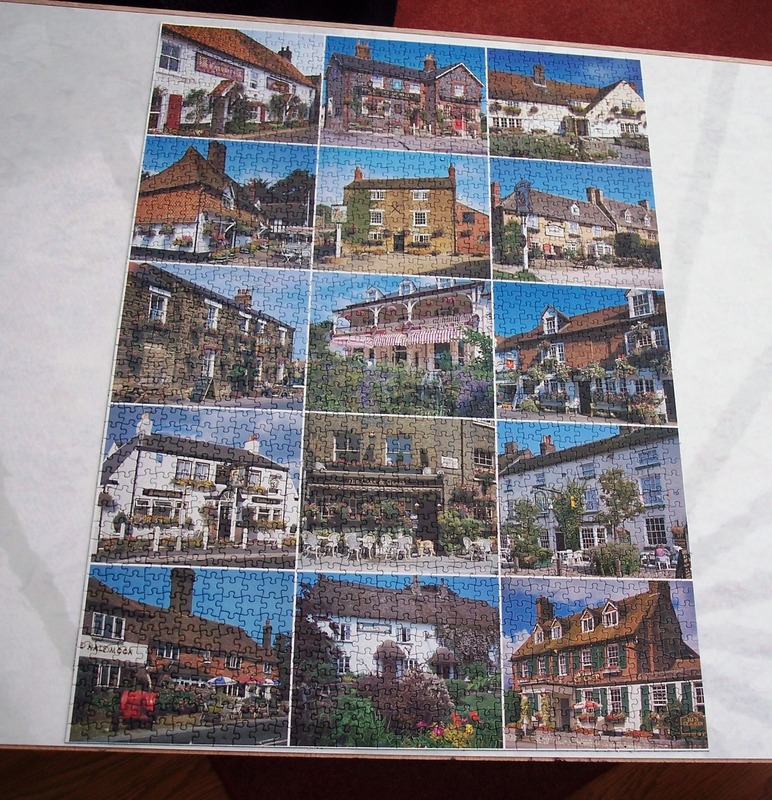 'Olde Worlde Inns' (all in England from what I can see), 1,500 pieces another library puzzle but all there this time. 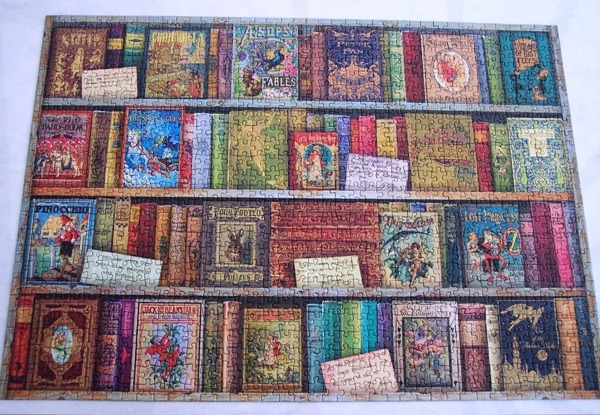 Another library one, 1,000 pieces, a bit Christmassy for February but who cares? 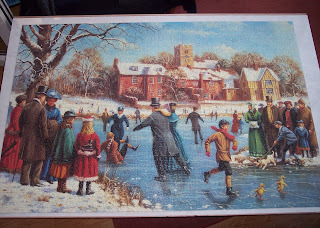 It was lovely to do. 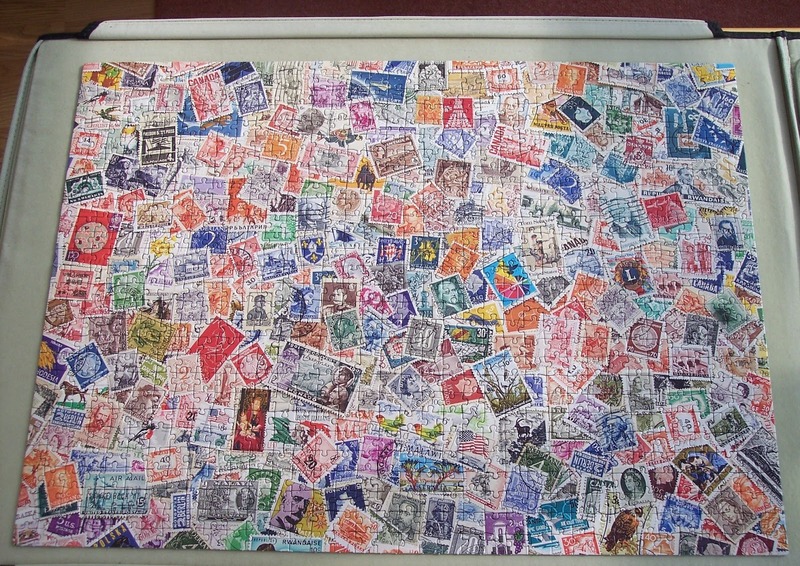 1,000 pieces showing, obviously, loads of stamps. 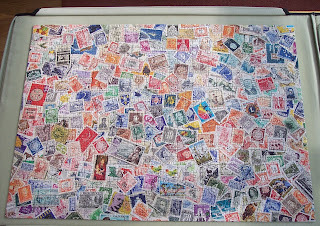 As an ex-stamp collector this was a real trip down memory lane for me. One of my own this time. 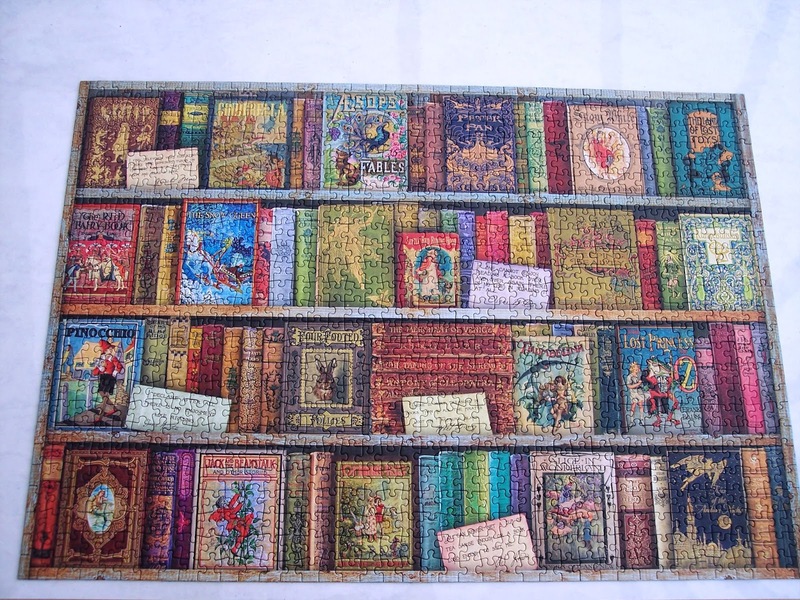 I think my jigsaw 'to-do' pile is almost as big as my book 'to-be-read' pile. LOL! 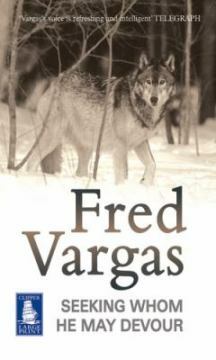 Book two of Fred Vargas's 'Commissaire Adamsberg' series of murder mysteries is Seeking Whom He May Devour set, not in or around Paris, but in the Mercantour National Park in the Alpes-Maritimes region of southern France. 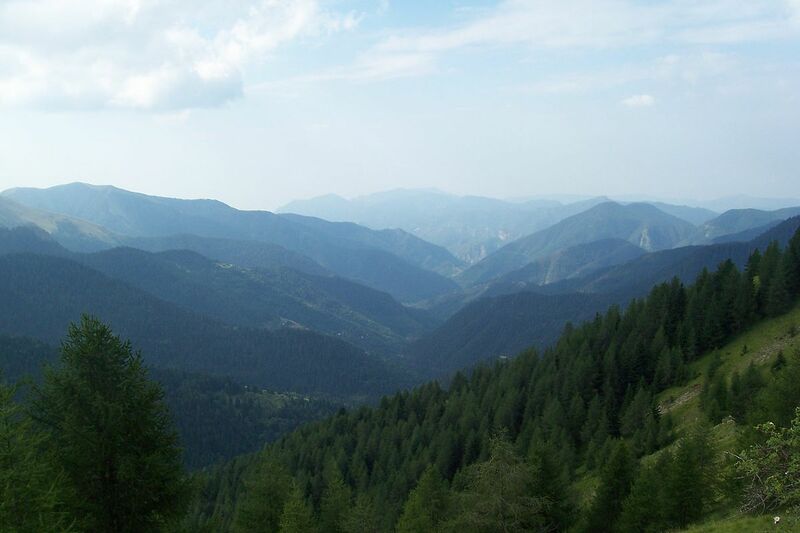 Naturalist, Lawrence Johnstone, a Canadian, is studying wolves in the Mercantour NP and is finding it hard to leave the area despite his work being finished. Partly he's come to love the region and the wolves but also he lives with a lovely young French woman, Camille, and does not want to leave her. Coincidently she is also an ex-girlfriend of Commissaire Adamsberg's. The two live in a small, very rural, village, Saint-Victor-du-Mont, where everyone knows everyone else intimately and also their business. A number of ewes belonging to a local farmer, Suzanne Melchior, are found brutally killed and a few days later so is the farmer herself. 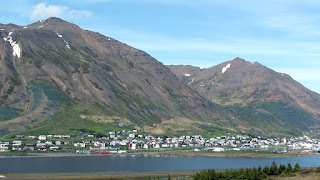 Johnstone tells Camille that Suzanne had told him confidentially she thought there was a werewolf on the loose and that she thought a local by the name of Massart was a likely candidate. It seems crazy but the sheep and the farmer have definitely been killed by a very large wolf, not a dog or any other kind of wild animal. I hadn't thought of a road-trip type murder story before but goodness, for an armchair traveller like myself, it works a treat! Especially one who loves mountains as I do. Adamsberg himself does not join the team until halfway through, but does appear before that concerned with other things. He's following the news of the murders on TV though, but has no idea why apart from the fact that he's from a mountainous region himself (The Pyrennes) and knows how isolated and different the people there can be with their unusual superstitions. The book is chock full of these quirky characters and that makes it very real and very amusing. As to the mystery itself, I had an inkling early on but abandoned it pretty quickly, which I shouldn't have done. But the joy of this story is not actually in the eventual outcome but in the getting there... 'the journey' as they say. Loved it and am now looking for the next instalment. 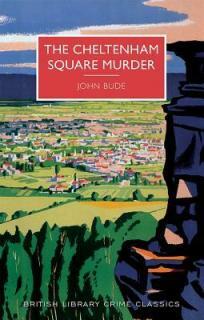 First up, The Cheltenham Square Murder by John Bude. 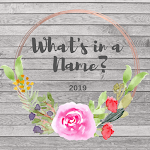 This is my first book for the What's In A Name? challenge which is being hosted by The Worm Hole. This one covers the category: A Shape. One Colonel Cotton, while enjoying an after-dinner drink with his friend Mr. Buller, is shot through the back of the head by an arrow and killed. 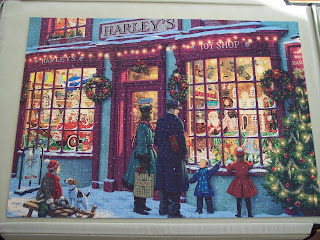 They both live in Regency Square in Cheltenham, it's quite up-market and peopled by a very motly crowd of individuals. What many of them have in common, unfortunately, is a love of archery. Superintendant Meredith is, coincidently, staying with a friend in the square and is brought in to help the local CID solve the murder. An archery expert calculates that the arrow must've been shot from a certain house across the square. But the house is empty, locked up, and on inspection it's clear no one has been there or could gain access. And although there are plenty of suspects - practically all of the inhabitants - they have either rock-solid alibis or absolutely no motive whatsoever. Thus, it's one of those impossible crimes. Excellent vintage crime story, this. Quite complicated with a large cast of characters but a diagram of the square, its house and occupants, at the start of the book, was very useful indeed. I didn't have a clue who'd done the deed until the police realised, but it was huge fun trying to work it all out as dribs and drabs of information were revealed. Nice sense of the area, Cheltenham and The Cotswolds, and a very nice 1930s feel to the whole book. I remain a bit smitten with these BLCC books. Next, The Birdwatcher By William Shaw. There were two reasons why William South did not want to be on the murder team. The First was that it was October. The migrating birds had begun arriving on the coast. The second was that, though nobody knew, he was a murderer himself. So, William South is a sargeant in the Kent police force. He's also a very keen birdwatcher and a bit of a loner, with very few friends. One of these friends, Bob Rayner, is found brutally murdered in his home at Dungeness, a headland and vast shingle beach on the Kent coast. Despite knowing the deceased, South is assigned the case along with a new to the area CID officer, DS Alexandra Cupidi. She has a teenage daughter and doesn't want to discuss the reasons for her move from London. South is not a happy man. So far throughout his entire career he's managed to avoid murder cases; this is his first, and it's his best friend. Or was he? It turns out South knew very little about Bob. Bob had secrets and discovering what these are is proving quite tricky for the police duo. But South has secrets too. 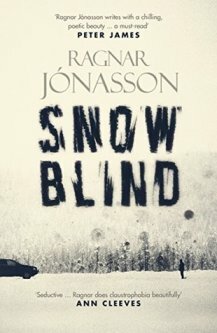 Can he discover the identity of a killer and not reveal his own very dark secret to the world? This was a random grab from the library... 'grabbed' because of its title. 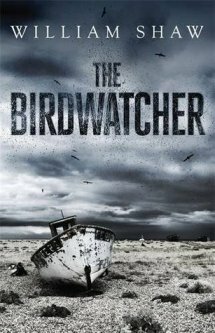 I too am a bit of a birdwatcher so a book with that title is naturally going to appeal. Sometimes these grabs work out, sometimes they don't... this one very definitely did. I love these murder mystery books where the writing is such that nothing holds you up and you can just read and read thereby wallowing in the case and the characters and the setting. The setting is marvellous. Sadly, I've not been to Kent so the Dungeness area is only familiar via TV programmes, Gardener's World featured it once for instance... the difficulties of gardening on shingle and with all that salt in the air. So I did know what it was like but not from personal experience. 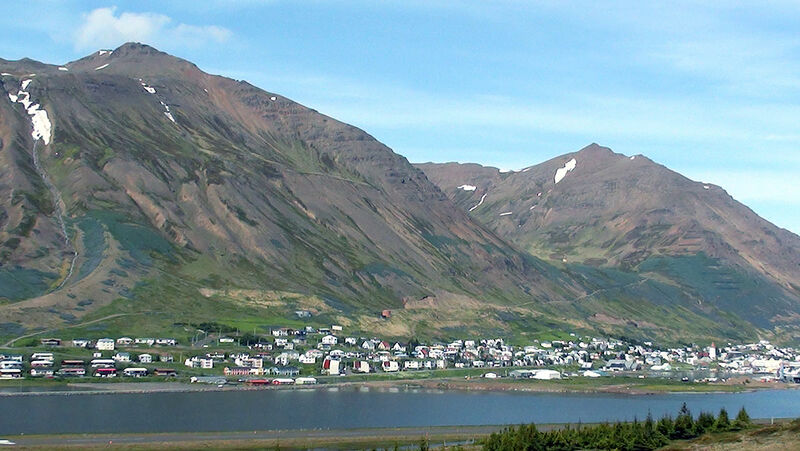 The author makes the area really come alive, and the windswept, lonely atmosphere is tangible. I liked South even though he's grumpy and anti-social. His background was fascinating. I'm not going to say what it is as that would be a spoiler, the details are slotted into the storyline seamlessly and to me were quite chilling. Anyway, this is a prequel book apparently. William Shaw is going to write a series about DS Cupidi, the first book, Salt Lane is due out in May. I shall be reading it.